Rex Healthcare, a member of UNC Health Care, is a private, not-for-profit health care system with 660 beds and a dedicated center for women's care. How do you promote maternity services and a sports-team affiliation in the same TV spot? Rex came to bp|d with a unique challenge: develop a campaign that would concurrently promote maternity services as well as communicate the health system’s partnership with the NHL’s Carolina Hurricanes. It’s endearing to see professional athletes sing or dance, especially if they are less than perfect. It humanizes them and makes us all like them even more. 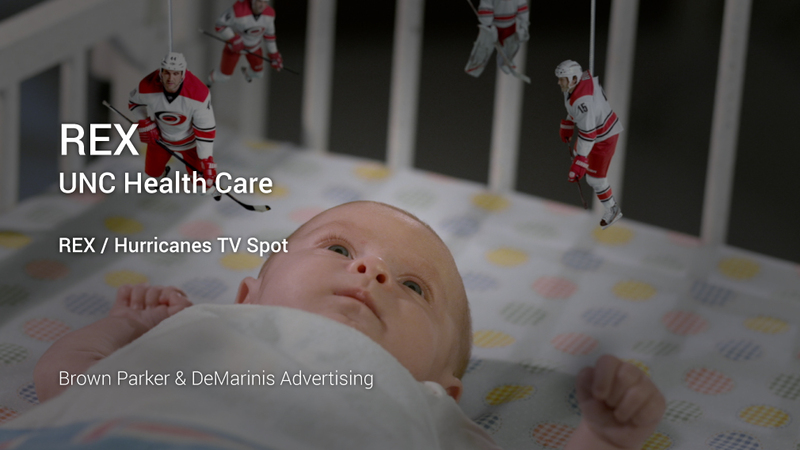 We created a 30-second TV spot of a nurse spinning a mobile made of toy hockey players to calm a restless baby. When the nurse leaves the room, the figurines come to life as actual Hurricane players dangling from the mobile who sing Brahms’ “Lullaby” to the baby. The spot ran on local TV, in social media and in the arena during games. In addition to airing during local TV broadcasts and at the hockey stadium during timeouts, the spot went viral, re-playing on local newscasts and throughout social media.